Stay in control of your system at all times. 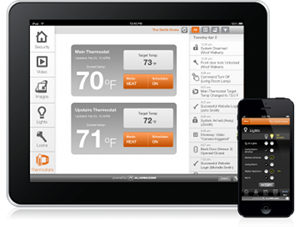 The top rated, easy to use mobile app puts your home in your hands. You can arm and disarm your system, and check the arming status at any time. Available for iPhone, Android, Kindle, iPad, Windows Phone. Don’t have one of these devices, you can still access using any smartphone or web enabled device. Get real-time notifications by text or email to know what’s happening at home, the moment it happens. Choose to receive alerts via text, push notification or email. Look back at activity over time or search for specific events. With the always-aware sensors and searchable event history, you can review any activity by sensor, type of event, date or time. Here’s what you need to know about the three main types of connected lighting hardware. Smart bulbs are what they sound like: bulbs that screw into your existing light sockets and connect wirelessly to your home’s security network. Now we’re getting smarter. These devices plug into a wall socket, with a lamp plugged into the device itself. Once you’re configured, you can start automating the lamp based on your smart home platform. For completely connected lighting, smart switches are the solution of choice. Unlike a smart plug, they can also control your hardwired ceiling lights. They also provide the best aesthetic look: they don’t take up a wall socket, and look as good (if not better) than standard light switches. We’ve discussed the apps/ website and hardware, but there’s much more to a connected Smart Home. Let us help you with Security, sensors, a great mobile app, and a powerful platform that connects them all.